Like the new A95 and A105 the A55 Cambridge was not a completely new model but an updated version of the A50 Cambridge. It had a similar re-designed rear end with larger rear window and the boot was 5inches longer with reduced sill height. Along the sides there was now a chrome strip which gave the option of a duo-tone paint scheme. 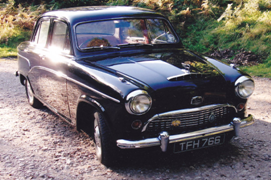 The A55 Austin Cambridge was also sold in North America as the Austin Cambrian. A de-Luxe version was available with Manumatic gearbox. Production of the A55 was wound down during the autumn of 1958 to make way for the new Farina model. Produced: Longbridge, 154,000 incl. Vans and pick-ups. Engine: 1489cc; 51bhp at 4250rpm; max torque 81lbs at 2000rpm; Top speed 77mph. Chassis: Length 13ft 10.9in; width 5ft 1.5in; height 5ft 0in; wheelbase 8ft 3.3in;Weight 2352lbs.